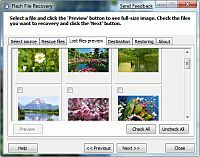 Flash File Recovery is a fast and simple in use utility for image and video files recovery. This is an essential tool for any owner of a digital camera, allowing efficient recovery of any corrupted or lost file from damaged or even formatted media. Flash File Recovery is a perfect software tool for both amateur and professional photographers as it can restore any deleted image or video file of almost any format. What is more, this easy in use and efficient utility can recover any corrupted or lost image and video file from formatted, damaged, unreadable or defective storage media devices. The utility works with various flash cards, memory sticks and camera built-in memory. Digital Cameras contain a full operating system that supports classical Input/Output operations on a FAT based file system. Due to memory constraints in early cameras (and possibly also to inexperienced developers), the file system implementations are sometimes a bit shaky. It is not uncommon to see cameras "wrap their writes around" when they don't realize they have reached the end of the card, erasing critical system structures located at the beginning of the media. Some cameras become confused when structures different from what they expect such as non-picture directories are present on a card; others are unable to switch safely from FAT-12 to FAT-16. Sometimes, a minor logical inconsistency leads to a major corruption of the card through what is known as the "avalanche effect" in datarecovery circles. I gave my camera to my friend for the holiday, but they deleted all photos unintentionally when they copied their pictures to the laptop. It was so sad, because I had my own pictures on the card. Thanks to my companion that he opened up Flash File Recovery for me and restored the pictures.